The commissioner of the NHL and players from the Toronto Maple Leafs and Edmonton Oilers paid a visit to Apple Park on Thursday, speaking to employees about innovation and technology in sports, and the collaboration between the league and Apple. 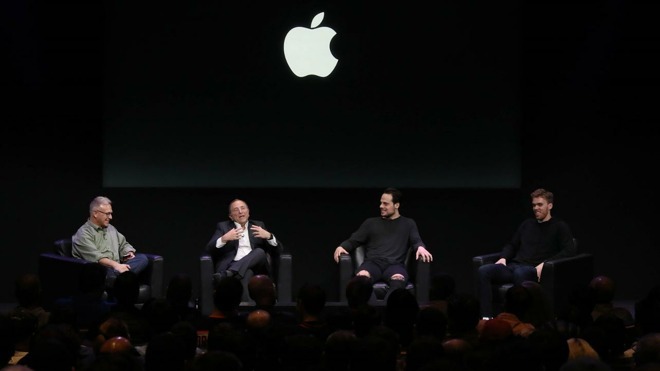 Occurring ahead of the 2019 NHL All-Star Weekend, NHL commissioner Gary Bettman, Edmonton Oilers center Connor McDavid, and Toronto Maple Leafs center Auston Matthews spoke on-stage with Apple senior vice president of worldwide marketing Phil Schiller. Around 300 Apple employees were in attendance, with the event also made available to view by employees located in other Apple campuses via a stream. "We love the collaboration that we have with Apple," Bettman claimed. "It has helped transform the game without changing the game itself." The commissioner is referring to the use of iPads by the teams that provides data to coaches and players on the benches. In 2017, coaches used iPad Pros and Macs during the Stanley Cup Playoffs, with real-time video streamed to iPads to give a closer look at the action on the ice. Earlier in January, the league announced it was going to provide coaches with a custom app on an iPad Pro, one that would offer more than 60 real-time individual and team statistics during a game, so coaches could be more informed for their in-game decisions. "I use it to prove to Hitch it wasn't my fault," McDavid joked, referring to discussions he has with coach Ken Hitchcock. Matthews claims he uses iPads to study the tendencies of opponents in face-offs, and that they are also used by the coaching team to advise on issues. "Our assistant coach is coming up with the iPad telling us what we're doing wrong and stuff like that," advised Matthews. "What these guys do and the other players in the league do every night on the ice is simply amazing, and to have the ability for players and coaches to get even greater insights into what's going on in the game, to make the adjustments that make a team more competitive and successful, is great," noted Bettman. The commissioner added "Our collaboration with Apple and things like the Coaching Insight, which we do with SAP and their cloud platforms, are all designed to make it better for the players, make it better for the coaches, and most importantly make it better for the fans. So we're grateful for all we do together." OK, considering the number of articles lately we have new iPad models coming and soon. If looking for a tablet form factor is there any other rational choice than iPad? Except for specific use e-readers like those Kindle's I don't think so. Certainly nothing on the Android side that I'd consider. iPads have certainly been a boon for the railroad industry! Up until the switch, each station had a bank of up to a dozen dot matrix printers buzzing away, printing reams of paper. Laser printers couldn’t keep up with the load! This was just last year! "iPad will revolutionize the way we engineer the next labor stoppage. The full-screen Lockout app is the bomb," Bettman tittered. I enjoyed the wording, "Matthews claimed," although "purported" would be funnier. This is great, though personally I’d be more interested in pro-am apps for tuning your own tennis swing or basketball shots. Not SF but Weekend Warriors.